Pune has a tradition for Yoga Training in India. Our Center in Pune is dedicated for Medical Yoga Training.Exercise makes us fit, but fitness and Health are not synonymous. Exercise alone is not enough to make us healthy. Yoga Training India is exploring ancient wisdom. It has theoretical & practical aspects of study. Our Yoga Courses India are offering both aspects to students. Our institute in Pune is renouned for its work in Medical Yoga Training. Exercise conditions our body called, training. In addition to body, Yoga conditions our sense organs, mind & intellect. Yoga training fulfills the definition of health given by WHO. “A state of complete Physical, Mental, Social and Spiritual wellbeing & not merely absence of disease or infirmity.” Thus Yoga Training is a comprehensive modality for health benefits. Yoga Training activity is a pursuit for perfection. Self study is the key factor. Our Yoga Courses in India is the prime activity in the field of fitness Yoga. It is the best way to reach more & more people to spread the message of Yogic study. Our center offers individualized Yogic Programme for Health. This includes study of Yogic Postures, Pranayam Yoga, Psychological and Cognitive conditioning, essential for health. The Latter two important studies are achieved by Shavasan, Pratyahar, Dharana & Dhyan. Ashtang Yoga training at our Yoga Institute in Pune offers multiple Yoga Health Benefits. 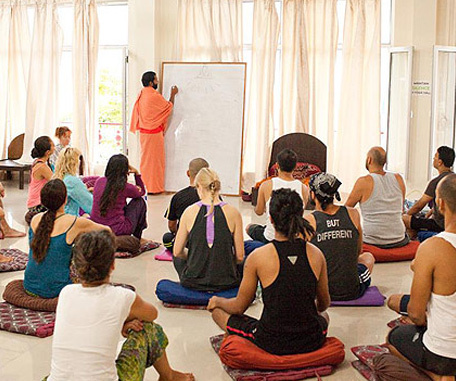 Our Center concentrates on efforts for Yoga Training in India as well as Yoga Courses in India.